The Duggar family, famous for their TLC reality show 19 Kids and Counting, embarked on a seven-state “Faith, Family, Freedom” bus tour on Monday to support political candidates who oppose “anti-family” policies such as abortion and marriage equality. The Duggar’s kicked off the event in Springdale, Arkansas to rally for Congressman Tom Cotton and have since traveled to Overland Park, Kansas to support Gov. Sam Brownback and Sen. Pat Roberts. The family has received positive and negative feedback from social media users about their new bus tour. “Great picture! !! Keep smiling and keep the faith! !! :) :) I hope and pray that you have a very blessed and wonderful day! !! :) :)” one person wrote. “True tolerance is allowing people to have different opinions…stop right there. 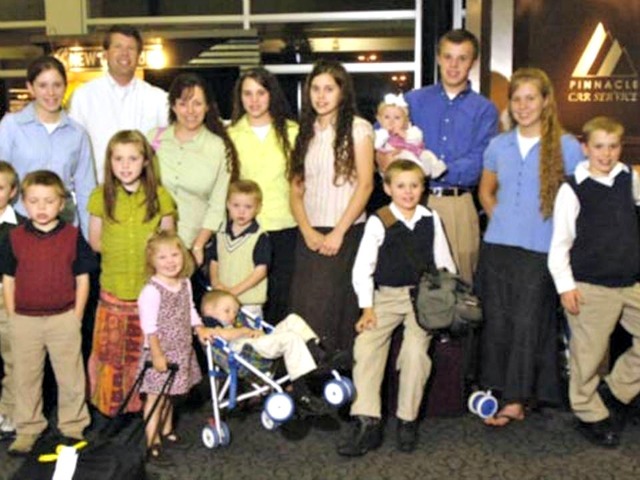 The duggars are bigots, and their values only benefit themselves. Newsflash: people who do not believe in Jesus really do not care about Jesus,” said another. Join us tomorrow in Springdale at 12pm for “Families for Arkansas” rally to kickoff @frcaction #FFFTOUR14 w/ @tomcottonar & @duggarfam!